Add a rainbow of color to your outfit with these beaded earrings. 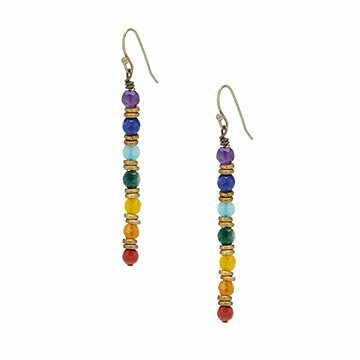 For this pair of charming chakra earrings, genuine gemstones in a rainbow of colors mingle with shimmering brass ringlets in a pillar-like design. Pair them with a gauzy white top to really make their color pop. Handmade by Carolina Elias in California. Keep in a dry place, and do not expose to excessive sweating. I like this for casual wear. It goes with so many things and can be a conversation starter. Disappointed in small size of earrings. Stones too small. Feel cheated. I saw these while I was Christmas shopping for others and loved them, so I put them on my list! My mom-in-law gave them to me. I just love them. I'm partial to this style anyway, and the gemstones are earthy and delicate. I've worn them everyday for the last week.